Gorgeous, Exuberant Crewel – Talliaferro is Back! For those of you who have been hanging out with me on Needle ‘n Thread for a while, you might recall a review I wrote about five years ago for the Royal Persian Blossom crewel embroidery instructional guide from Talliaferro Classic Needleart. For those of you who are newer to the fold, if you haven’t seen that instructional guide, take a look at it! It’s worth a gander! When that design first hit the market, I was thrilled! Here was traditional crewel embroidery, kicked up about a hundred notches into something new, something artistic, something fabulously exuberant, and yet worked in traditional crewel techniques, with wool. Well, you’ll be most happy to know that Anna, the artist behind Talliaferro, has done it again, recently releasing a stunning new design called La Serenissima. Today, I want to show it to you and review the instructional guide for this gorgeous piece of modern, yet traditional, crewel embroidery. This is La Serenissima, worked in a palette of pinks and shadowy greens, with highlights of golden honey and nut browns. The design itself is quite large – about 14.5″ x 11.5″. It’s definitely suitable for an heirloom cushion, for a focal display on the wall, or I could even see it as an upholstery piece coming up the back of a small decorative chair. Talliaferro’s instructional guides are just that – instructional guides, not kits. The instructional guide is a printed portfolio, very classily done, that includes all the information and instructions you need to complete the piece. 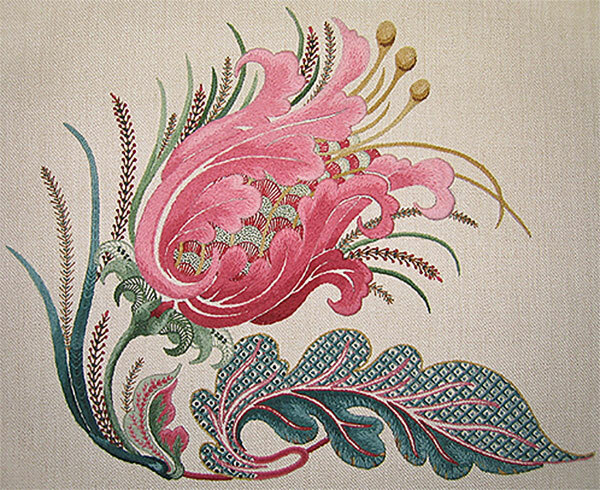 You’ll find information on crewel embroidery in general, information on fabric and thread choice, suggestions on pattern transfer and setting up the project. There’s a full-sized pattern included (and it’s huge!). Finally, there’s a detailed booklet that takes the stitcher step-by-step through the whole piece, using very clear diagrams and written instruction. The most challenging part of the piece is the shading and direction of stitching with the long and short stitch, but the instructions are very clear, with each element taken apart and carefully mapped to ensure success. The original design is worked in Heathway wool, which is a soft, beautiful merino wool. In the instructional guide, you’ll find the color and shade list for Heathway, but you’ll find a chart with color suggestions for Appleton wool, too, if you want to substitute. I wrote about Heathway wool many years ago in this comparison of wool threads for crewel embroidery. It really is a lovely wool to stitch with! The wool is produced by the folks who used to produce Pearsall’s silk embroidery floss (which, to my knowledge, has been discontinued), but I’m assuming Heathway is still strong in production. It’s used by several designers and is available online in various places. Barbara Jackson, for example, uses it in her lovely little crewel kits and sells the whole range of Heathway wool at Tristan Brooks. 1. Directly from Talliaferro Designs, where you’ll find Anna’s other instructional guides for her gorgeous crewel work also available. 2. Through Wooly Thread, which offers the instructional guide alone, or with your choice of the Heathway thread pack or the Appleton substitute thread pack. Thread packs are a great way to go – you get all the threads you’ll need for the project, without having to hunt them down individually. If you’d like to enjoy browsing through some really gorgeous pictures of crewel work, don’t miss Anna’s gallery on the Talliaferro website. I think you’ll get a good hint there of what’s to come. I’m so happy to see Anna’s new instructional guide out, and I hope those of you who love crewel will find this project just as gorgeous as I do! Next week, I’ll have a wee related surprise for you – I think you’ll like it! I’ll be stitching up a storm this weekend – can’t wait! – and I hope you have a jolly weekend with your needle and thread, too! Anna’s work is drool-worthy. She has a piece done in pinks and reds–a peony, I think–that I come across every once in awhile and just gaze at every time I see it! I was out yesterday I seem to be galvanting a Iot lately. 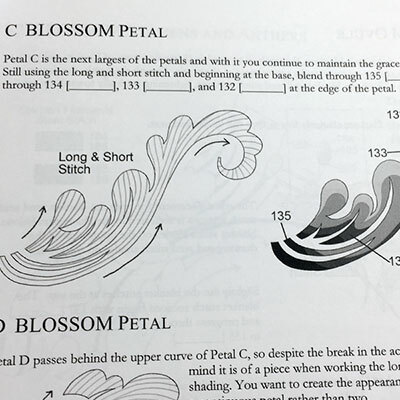 I remember the Royal Persian Blossom I bought the instructional guide and still have it to tackle someday. Anna’s gallery is lovely full of wonderful embroidery and the La Serenissima is beautiful. Thanks for sharing with us the new La Serenissima embroidery project and for explaining the guide. I can’t wait for the wee related surprise what is it, do tell all. I hope your stitching storm is enjoyable, I hope you have a great weekend. My comment has nothing to do with today’s post, but an earlier post…antique pattern library. Amazing! Spent half my afternoon delving deeply into these lovelies. Thanks so much for the information on this site. Happy Valentine’s Day. What a wonderful piece! It might just be one of the 2 new pieces I am limiting myself to buying this year (I have way too much in my stash). I even feel much more confident about doing it having just spent the weekend in a class with Phillipa Turnbull … what an absolute joy that was. On that note, Phillipa uses hoops for all of her work, even very large pieces. She uses then unbound and with a piece of plastic wrap between the top of the embroidery and the hoop to protect it from any damage. Plus you just leave it in the hoop while you are working. Granted this is for wool stitched on linen twill, but I suspect it would work well for cross stitch too (considering my own past practice). I love Anna’s work. I’m waiting patiently (well almost) for the Autumn Oak Sampler! La Serenissima is a stunning work. I’m somewhat a beginner and I’d love to take this on. The Crewel embroidery is so beautiful and detailed. To be able to add intricate color to the already beautiful design is intriguing and challenging to me. I’m getting ready to go thru my second round of chemotherapy for stage 4 breast cancer and the long 4 to 6 hrs your just sitting there this would be wonderful to add something like this to look forward to at the end. Marilyn S. Just started following your blog a month ago. Watching your projects come to life as you stitch is so mesmerizing! La Serrinissima is beautiful!